Our Grand Final Show: Wed September 26! 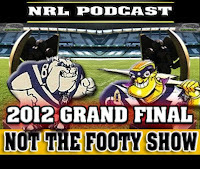 Today we give you the best press from the mainstream press on the Grand Final... and we haven't filled it with dribble. So enjoy. So here is www.wdnicolson.com's wrap of the Grand Final Press on Monday. HEADLINES: Barba's Mum and Dad, Tolman wanted to stay at Storm and Gould Gold. The Quote: "No one expected us to do this well but he has just put a lot of belief in myself and all the boys." The Quote: "I just had to do what's best for myself, my family and my footy and I'm loving it here." The Quote: "Hasler will know they are coming. He will steel his men for the challenge. I love this stuff." HEADLINES: Storm still not happy, Waqa set to replace Fonua and more Gould Gold. The Quote: "What Frank Ponissi has been able to do with the roster since that time has been amazing." The Quote: "I’ve just been real fortunate with the way things have gone throughout the season." The Quote: "Just because you pay a footballer more money, it won't make him a better player." Oh and the NRL admitted Billy Slater did knock on before 'scoring' his first try on Friday... pity Bill Harrigan didn't watch the whole replay because Will Chambers lost the ball in the play the ball for crying out loud! PS. There will be no links to articles in a particular paper this week... Grand Final week or not, plus technically Queensland's Courier Mail isn't Sydney's 'paper'. Right now, the Storm remain my slight favourites. Though team news on Tuesday will change this view potentially. WHAT STORY DID YOU ENJOY or LOATHE TODAY?